Created for Henry Block (H&R Block Co. LTD) and his wife Laura. The dolphins are central features to their ocean front home overlooking the straits of Georgia in White Rock BC. 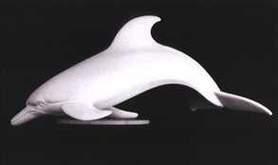 A total of three life-size dolphins were created for this installation. Two dolphins (not shown) were selected for placement on a structural post situated in the living room line of sight to the oceanview. They were sculpted and placed to appear to be swimming, circling up the post. 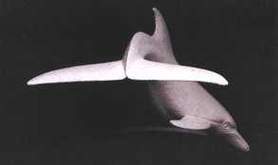 The 3rd dolphin, the 'balancing' dolphin (shown here) was placed on a pedestal, again in line of sight to the ocean, where its balanced design is allowed to rock on its pectoral fins, moving gently in the sea breeze.